This card is for Meljen's challenge to use 2 images-you can use 2 of the same images or 2 different images! 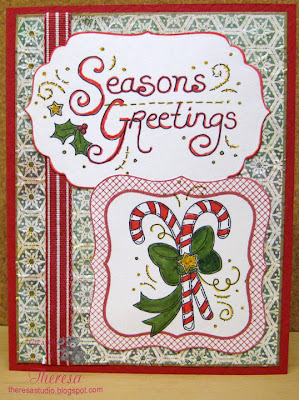 I decided to make a Christmas card using 2 of her images - Seasons Greetings and Candy Canes. I colored the images with markers and gold jelli glitter pen.Wish I had printed the Seasons Greetings a bit smaller but had started so I finished as is. Used red base card with a mat of Basic Grey Jovial paper that I embossed. Added candy stripe ribbon to finish. Plan to send this to Caring Heart Card Drive. Simon Says Challenge: Punch em ...use punches and dies. 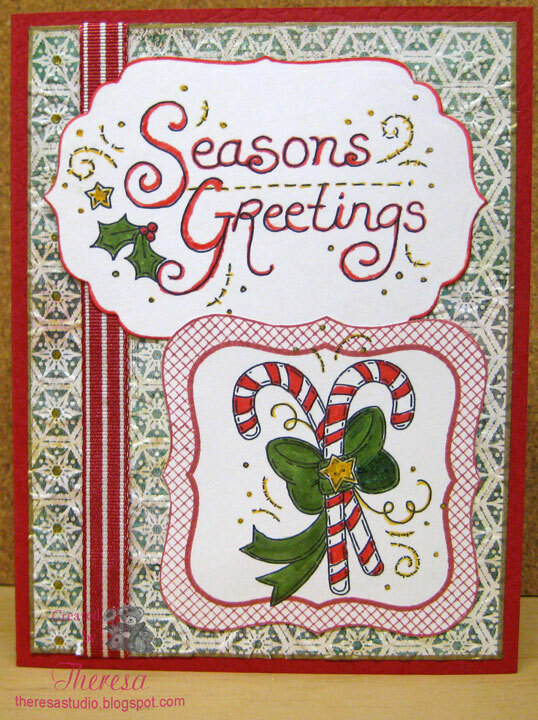 The Creative Cottage: Use embossing...Mat is embossed with CB EF Snowflakes. Digi Doodle Shop's Best: Anything goes. Christmas Card Challenges: Use candy canes on your cards. Wild Orchid Challenges: Use classic Christmas colors of red, green, and gold. This is awesome, everything works together perfectly! Very pretty card! Love the candy canes. So glad you joined us for this weeks CCC! Gorgeous card! Thanks for joining our challenge at Digi Doodle Shop's Best! Very pretty! Thanks for joining us this week at Christmas Card Challenges! Beautiful card. Love those dies and that image. Those candy canes are gorgeous!! Thanks for joining us on the Simon Says Stamp Challenge blog. Adorable card! Thanks for joining us at Meljen's Designs! Gorgeous Christmas card - love the candy canes! Thanks for playing along with the Crafty Critters this week and we hope you will join us again next week! It's really nice! Like the candies image and how you've colored it. Thank you for your nice comments the other day! This is a pretty card and I really like how you used the nesties! Thanks for joining us at Critter Sketch Challenges this week! Thanks so much for joining us at the Critter Sketch Challenge Blog! Hope to see you again next week! !